These directions apply if you are an existing member of the Potomac Curling Club with an account in our online system. Most people are renewing members. Full Season Renewals: Please choose the same "Full Season" Membership Type as your Fall 2018 registration. Your fee will be $0. Half Season Renewals: Please choose the desired "Half Season" Membership Type for Spring 2019. Your fee will be based on the selected type. Youth, Parent & Social Renewals: Your memberships do not need to be renewed. Enjoy your holidays! Read Step 4! After you complete registration, there will be a "Pay Now" button. You must submit payment for your registration to be complete! You MUST login before filling out the membership form. If you do not login, we cannot guarantee the timely processing of your submission. If you do not remember your username, use the Forgot My Username page to retrieve your account. If you do not remember your password, use the Forgot My Password page to reset your password. DO NOT use the new member registration page. 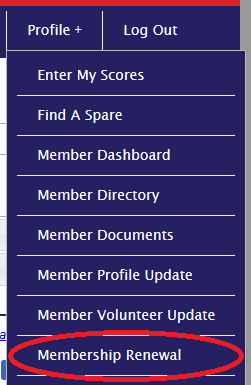 Under the "Profile" menu, click on "Membership Renewal"
If you are a Curling member, please check the box for any and all leagues that you wish to register for. Finally, add any "Additional Registration Options". Click the "Validate Registration and Calculate Fee" button. You will see your total cost listed at the bottom of the form. If you are satisfied, click "Complete Registrion". If not, click "Go Back to Revise Form"
Please Read These Directions Carefully! This is your only chance to pay online. Click the PAY NOW button on the right side of the screen. You are NOT required to have a paypal account. You can pay with any credit card. All members are required to pay dues on or before October 1st (Or make the initial payment on an agreed upon payment plan) to retain membership and secure your spot in any registered leagues. Need a new name tag? Order one online!